Love the outdoors but have a wider than average foot? If that’s that case you’ll want one of the best hiking boots for wide feet. There’s a few thing you need to think about when making your selection, though, and I’ll show you what’s most important – after you’ll see my top picks for both men and women. I’m sure you’ll see a product you want to wear by the time you’re done reading! Hiking Shoes: Hiking shoes are lightweight and very comfortable. They aren’t as durable as tougher boots and shouldn’t be worn on longer hikes – they’re made for day trips. 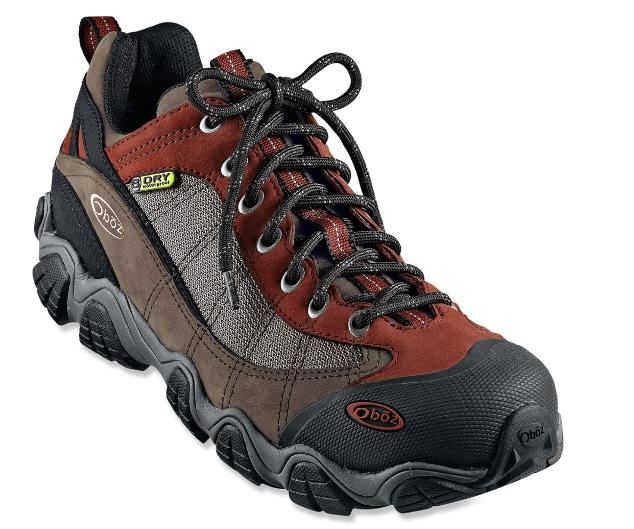 Day Hiking Boots: Day hiking boots are made for short trips and are light weight. They’re more rugged and durable than hiking shoes. Backpacking Boots: Backpacking boots are very sturdy and are made for longer treks (multiple days and nights). These products tend to be high cut and weigh the most too. Next, you need to look at the materials that make up the boot. Some materials are more weather proof than others and some are more durable. There’s different leathers and synthetic materials to choose from and I’ll go more in depth about each one when describing the products coming up. If you want to learn more about selecting hiking boots, click here. Now that you know exactly what to think about when making your purchase, let’s look at my top wide boots for men – my top picks for women are directly after. The Keen Targhee II Mid is a product that almost everyone should consider and is a boot that you’re going to love to have on your feet. One thing that really makes this product worth it is how waterproof it is – basically every single aspect is made to keep your feet dry. Two reasons for this is the nubuck leather upper and the KEEN.DRY membrane. You know what else is cool? The Targhee II is breathable too. This means it won’t let moisture in but it lets moisture out to prevent overheating and oversweating. You won’t have to worry about blisters because of this. Removable EVA midsole is ultra comfortable and lets you enjoy a custom fit. S3 heel support that absorbs shock and makes sure your hike is smooth as possible. Very stable and this means you can hike for longer periods of time without having to stop. KEEN.PROTECT toe bumper shields your toes and ensures they won’t get injured if something falls on them. Non marking rubber allows you to wear these boots indoors without scuffing up the floors. Multi-directional lugs improves the overall traction of this product and you won’t be slipping on slick surfaces. The Lowa Renegade GTX Mid is very popular and one of the highest selling boots on the market – it’s also perfect if you have a wider than average foot. This is another product that’s both waterproof and breathable too. The reason the Renegade’s is able to do this is it’s made with GORE-TEX liners. You can find GORE-TEX in all kinds of outdoor products like ski gloves and ski jackets. This material is universally loved and does a great job keeping your feet dry. It’s goes even further keeping moisture out because it has nubuck leather uppers. Cordura ankle bands that’re extremely comfortable and ensures you can walk with these boots for as long as possible. It has a padded tongue that helps in the comfort department as well. Gusseted tongue keeps debris from getting inside of the boot and causing unnecessary pains on your hike. Polyurethane midsole absorbs shock and is another reason you’ll be able to hike longer than ever. Vibram outsole means you’ll get the most traction possible. You’ll really appreciate this when it’s a little slick out. 22 different colors and designs to choose from so you get the perfect look. Because this is such a high end product, it’s going to cost a little extra to buy. I wouldn’t say the price is crazy high but it’ll cost more than most on this list. I personally think it’s worth every penny and there’s thousands of hikers that would agree with that. The Merrell Moad Fst Mid is not a boot you’ll want to wear if you plan on taking long treks. This product is made more for shorter hikes and day trips. If you’re someone that likes to get outdoors for fun or for recreation, you’ll like what you get here. One thing I know your’re going to like is how lightweight the Moad’s feel to wear. You’ll feel very mobile with these on your feet and you’ll be able to go longer than ever because of this. M Select Dry waterproof seal ensures your feet are bone dry the whole day and you won’t have to worry about blisters developing. Mesh lining means heat and moisture can escape. This is good if it’s a little hotter out. Merrell air cushion is ultra comfortable and absorbs all shocks. This comes in handy when you’re walking over rough and rocky terrain. M Select Fresh keeps foul odors at bay and ensures these boots smell good after long hikes. Vibram MegaGrip will keep you on your feet and prevents you from slipping all over the place. In terms of price the Moad isn’t too bad either and should fit into the budget of all outdoor enthusiasts. I really like this product and think you will to if you decide on it. Salomon is a company that I really like and I seek out their gear whenever I get the chance – for the last few years I’ve skied with their boots and they make awesome wide ski boots. Their X Ultra 3 Mid GTX’s live up to their high standards and is a product that works for day hikers (Check out my full review of this boot). If you plan on hiking the Appalachian Trail or spend multiple days and nights out in the wilderness, you’ll probably want to look elsewhere and for a boot that’s a little more sturdy. GORE-TEX liner is both waterproof and breathable. This means these boots let moisture out but won’t let moisture in. Great traction ensures you won’t slip and you’ll be able to stay on your feet. Gusseted tongue keeps debris out and rocks and other small things won’t get inside. Rubber toe guard makes sure your toes are protected and won’t get injured if something falls on them. Extremely lightweight and you’ll feel ultra mobile with this product. Molded EVA midsole improves the overall comfort of the X Ultra’s and you’ll love having them on your feet. This is another high end product and one that costs a little extra to purchase. They’re worth the little extra and you’re going to come to the same conclusion if you decide on these. These boots are one of the best you can get! There’s been a few products on this list that weren’t really made for backpacking and are geared more towards day hikes and shorter trips. That’s not the case with the Asolo Fugitive GTX – this boot can be worn for serious treks. Even though this product is very stable and sturdy, it’s not overly heavy either. This means you’ll get a product that can stand up to rough terrain but will also help you feel very mobile. Cordura nylon upper that’s both breathable and waterproof. You also get GORE-TEX liners that you’ve seen on a few of the previous boots. This is another reason why this product is breathable and waterproof. Reinforced rubber heels and toe boxes is why the Fugitive GTX lasts so long. DuoAsoflex midsole is shock absorbing and means you’ll feel good when hiking on rocky trails. Comfortable midsole and a high quality traction that won’t let you slip on slick surfaces. The Oboz Firebrand II is a nice lightweight product that’s perfect for shorter hikes – one that lasts less than a day. Because of this serious outdoor enthusiasts should stay away and look for a boot with more stability (like the previous one). One thing that the Firebrand II excels in is comfort. The insoles of this product are biochemically engineered with 3 layers of EVA foam. This relieves pressures points and other areas that commonly cause pain in your feet. Hydrophobic uppers that are both breathable and waterproof. The end result is your feet are always dry. Sawtooth outsoles provide a ton of traction and you’ll feel extra secure when walking on slick surfaces. Non-marking rubber soles means you can wear them inside without scuffing up your floors. Lightweight and you’ll feel especially mobile with these on your feet. Like many of the other products on this list, the Firebrand II is moderately priced – not too low or too high. If you’re looking for an ultra comfortable day hiking shoe, this is one that you’re going to love. I already went over the Renegade’s for men and said it was one of the most popular and highest selling boots on the market – this is the same for the women’s version. This is a boot that all outdoor enthusiasts should consider and one that you’ll love if you do. One thing that makes this product worth it is that they come with GORE-TEX liners. These liners ensure water can’t get in but also allows sweat and moisture to escape. The result is you’ll have completely dry feet no matter what the conditions and this reduces the likelihood of blisters. Cordura ankle bands increase comfort and you’ll be able to hike farther without any pains. Padded tongue is another reason this product is so comfortable to wear. Polyurethane midsole absorbs shocks and eliminates pain associated with these shocks. Highly supportive and you’ll feel very confident no matter what terrain you’re walking on. Vibram Evo rubber outsoles provide a ton of traction and will prevent you from slipping. 17 different colors and designs so you get the exact look you desire. Here we have another product that basically everyone loves and the Merrell Women’s Moab 2 is made specifically for people looking for extra mobility. The reason I say this is the Moab 2 is lightweight and is a mid design. If you’re someone that spends every second hiking trails and in the wilderness you may want something a little more sturdy. But every person short of that will appreciate what this boot can do for them. M Select Dry makes sure your feet stays dry through out the day. It does this by preventing water from getting in but letting moisture escape. Closed cell foam tongue keeps debris and rocks from getting inside this boot. Rubber toe cap ensures your toes won’t be injured from stubs. Very comfortable EVA footbed means you’ll get comfort all day long and be able to hike farther than ever before. Air cushion in the heel absorbs shock and is another reason this product is ultra comfortable. Vibram outsoles provide superior traction and keeps you from falling. This is a product that I would say is perfectly priced – it doesn’t cost too much but certainly isn’t cheap either. This makes it very attractive for many different hikers and is definitely worth checking out. The Vasque Women’s Breeze III GTX is a product that you can go for miles on and feel awesome. One aspect this product really excels in is waterproofing. One of my friends wore these out for a long hike and during this trip she had to cross 15 river streams. By the time she finished this trek her feet were completely dry! This is a boot that truly will keep water out and this is such a life saver. You won’t have to deal with soggy socks and you won’t have to deal with blisters. No break in time and you can wear the Breeze III’s right out of the box. Leather uppers provide a good amount of support and help you feel extra confident when you’re going over sketchy terrain. EVA cushion pods improves the overall comfort of this product. Vibram Contact Grip Outsole keeps you from slipping even if it’s really slick out. I consider this boot to be a little pricey but nothing too crazy. When you want the best you’ll have to pay a little extra and that’s the case here. You also get 7 different colors to choose from so you can find one that works best for you. Here we have another high end product and Oboz does a pretty cool thing if you purchase their Women’s Bridger B-Dry. For every Oboz boot that gets purchased, this company plants a tree. So if you’re concerned about this type of issue you can help out by buying the Bridger B-Dry. You’ll also get a boot that performs well out in the outdoors if you decide on this product too. Like many of the boots on this list, this one does a good job in the breathability and waterproof departments. Soft leather materials don’t need to be broken in and can be worn on the trail right away, from the box. Deluxe footbed helps support your arches and ensures you’re as comfortable as possible. Dual density EVA footbed is another reason this product is so comfortable. Your toes are protected from injury with a rubber toe box. High friction outsoles makes these extra grippy and provides a good amount of traction. Pretty lightweight and they won’t exhaust you on longer hikes. Put this product in the category of a tad expensive but definitely worth it. If you’re looking for high quality footwear that won’t cause any pain, this is one that you should definitely consider. Last on the list is the Salomon Women’s Ultra X Ultra 3 Mid’s and this is a product that’s surprisingly lightweight at 1 pound 13 ounces. If you’ve ever worn heavy and bulky boots, this is something that you’re going to appreciate a lot. Another aspect that you’re going to really appreciate is the Ortholite sockliner and Ortholite foam. The combo of these two makes a really comfortable boot that you’ll be able to go miles on. GORE-TEX materials ensure this boot is both waterproof and breathable which is exactly what you want to have the most enjoyable day. Very stable product and you’ll be able traverse rough terrain with these on your feet. Contrgrip outsole provides a ton of traction and keeps you from slipping. Mud guard and rubber toe box protects against rocks and other objects. Secure fit and you’ll feel very confident while wearing this product. I wouldn’t consider the Ultra 3’s cheap but you don’t want cheap hiking boots. That’s just going to lead to issues and a miserable time. You want to make sure you’re getting quality and that’s exactly what you’ll get here. Only Hike With The Best! If you want to have a good time hiking you’re going to need a quality pair of boots and one that fits well. If you have a wider than average foot and wish to have quality, anyone of the products on this list can work for you. There’s one for all budgets and needs too! Are you excited to try out your new boots?